A quiet death is the second (of a total of three) movie by the very obscure Greek director Frieda Liappa, who sadly passed away when only 46 years old in the ’90s. It’s very hard to find sources not in Greek language on her and I stumbled upon this title by pure chance. The movie is an interesting experiment, very close to psychoanalysis (in one of the rare English language sources I’ve been able to find about Liappa, she directly mentions Lacan), surrealism and existentialism, all of them rendered through a very minimalistic and allusive style. A quiet death tells about an unsatisfied woman, Martha, who is clearly affected by borderline disturb. This fact is never directly stated, but hinted through the movie and the flow of Martha’s imagination, reactions, relationships. The director had a great deal of sensibility and intelligence in portraying the characters’s psychologies and afflictions. Maybe she was directly involved, on a level or another, with psychoanalisys herself. Without clear sources, it’s hard to know. It’s only possible to try a guess. We don’t get to know a lot about Martha during the movie. In fact, her past is really obscure and the movie reveals very little about it. We find her in a turning point of her life, a fall back in her fragmented psyche, and a moment of recollections and we found her trying a balance in her life. The movie hints that she may have be a writer, but incapable of completing her works. We find a situation of great confusion and suffering. She states a lot of times that she is actually unborn, suspended in life, with a psyche and an identity fragmented and mined by life’s hardships and her own neurosis and borderline disturb. The tipping point seems to be the recent death of her grandfather, who Martha lived as a firm point, an important person to keep her identity in one piece, like an omnipotent being, almost superhuman. The movie doesn’t have a real plot. There isn’t a definite progression of events or a climax. The director focuses on the absence, the silence (the movie uses a soundtrack only in certain parts of it, one of the pieces being a beautiful song by Jeanne Moreau), the shift between the inner and the outer point of view, the oneiric images to portray Martha and her inner world, her wounds. Liappa puts a lot of emphasis on the distance, the solitude: the dialogues are fragmented, people are distant, Martha is an enigma to herself and the others. Communication is often failing in reaching intimacy and moments of truth are mostly reached alone and are very difficult to convey to others. 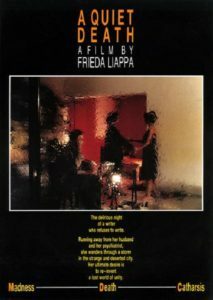 Despite the lack of a proper plot, it’s possible to divide the movie in two parts: the first half is more focused on the chaotic intimacy between the walls of Martha’s flat and the relationship between the three main characters (Martha, Markos and Anna), the second half sees an exploration of the outside world, under the sign of oneirism and surrealism, both of them used in an intimate, minimalistic way. One of the main keys is scission, the breaking up. Martha states more than once that she is not born, reality and fantasies are mixed together, there isn’t a clear temporal division. The past intrudes the present which is the stage for the past once more lived. For healing from this, there is a search for intimacy which fails: the seduction, the beautiful nakedness, the search for love are strongly tinged with masochism. The body is wounded, the seduction deceives and love doesn’t completely break the wall. There is a constant motive of self destruction and, in contrast, a strong remembrance for the times of infancy, where life was blooming, as a consequence of the failed initiation to life. A search in the two extremes of positive freedom and negative self destruction. 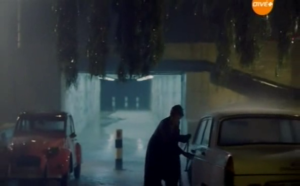 The rain is a very good symbol for this, summarizing all that has been said up to this point. It stands for the desire of purification, for the separation and the flooding of unconscious content that constantly happens in Martha. The difficult condition of Martha and the enigma that she holds, push the others, her ex lover Markos and her therapist Anna, to find their own shadows and weak points, the truth hidden in them, and to express them, but in solitude. Again, intimate communion is hard. They are also portrayed at the beginning of the movie, naked in the water, with a small child, a symbol, maybe, for the oedipal triangulation and the difficult relationship of Martha with her parents that her projects on the two. Also Martha’s deceased grandfather appears like a ghost-like figure, like a bond that served her not to break but at the same time, a too strong idealization that also partially imprisoned her internally, as a figure too strong inside herself. In these muddy situations, there is a constant struggle for liberation and positive freedom, not dispersion, and love. The switch of the point of view between inside and outside view symbolizes the scission and the only partial intimacy, until the beautiful, but also sad, conclusion. A quiet death is a very original experiment that reveals a very developed sensibility but also poses some questions. The lack of a plot or a clear direction at the same time helps and hinders the movie. It’s a very felt,interesting and beautiful look, done by a woman and conducted with a very developed feminine sensibility, on the themes of insanity, division, melancholy, solitude. A strong Lacanian influence also can be found in the movie’s focus on the themes of separation and fragmentation.It’s interesting to ask oneself, also, why the modern/contemporary cinema (and art in general) focused so much on the illness but, unlike a lot of artists in the past, did not find a point of synthesis, a way to get out of the difficult shadows. It makes one think. As a final curiosity, the actress that played Martha in the movie (Eleonora Strathopoulou) really became a writer, like Martha (but let’s hope with less distress), after leaving cinema, with this movie being her last one. Subtitles (.srt format) Important! These subtitles are not made by me. I’ve just found them online.